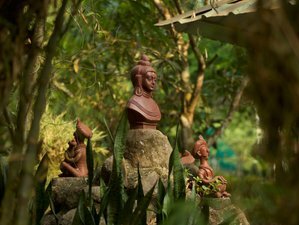 Hinterland Village and Bodhi Center offer Detox and Rejuvenating retreat if you are looking for a relaxing and peaceful holiday amidst the tropical greenery of Kerala. This retreat offers you the perfect guidance and space whilst being held in the embrace of a deeply supportive and restorative detoxification program. Harmony with what you think you are, and what you are really. For most of us, life is a bundle of ever-changing bodies, thoughts, emotions, fancies, day-dreams, goals, people, circumstances, and plenty of unnecessary mental baggage, including boredom. If you really read your own life-story, you might be surprised to find that, the only thing missing is: You. Hinterland Village is a homestay type of accommodation where you can get all the warmth and care that remind you of home with the added benefits and luxuries of a resort. Each of the available rooms is different and offer a unique blend of antique charm with modern comfort. There are a number of options of shared, double, or single rooms. All rooms are air-conditioned and offer stunning views of the surrounding greenery. The retreat program which is a specialized procedure of Ayurvedic treatment necessary for releasing unwanted toxins from the physical and astral bodies by giving a healthy status to the bodies. It not only cleanses your body but also lays the groundwork to re-energize and strengthen your bodily systems. With our modern lifestyles and food habits, unfortunately, more toxins into the bodies are taken than ever before. Over time these toxins build up, creating lethargic digestion, metabolism and unenergetic bodily systems which in turn creates a disturbed mind, restlessness and inadequate health. Detoxification program can also act as a natural preventative for future ill health and much needed rejuvenation of your bodily systems. At Bodhi Center our doctors are specialized in detox programs and includes natural techniques such as fasting, colon cleansing and holistic weight loss programs through balanced diet and practice of Yoga asana therapy. Basti (enema) is considered the mother of all Panchakarma treatments since it cleanses the accumulated toxins from all the 3 Doshas (Bio elements) that are Vata, Pitta and Kapha, through the colon. Medicated oil or ghee and an herbal decoction are given as an enema to clean and oleation of the colon and increase the muscle tone. This procedure is usually applied for 5 to 7 days according to the health of the person. Basti helps you cure hemiplegia, paraplegia, colitis, convalescence, cervical spondylosis, irritable bowel syndrome, constipation, digestive disorders, backache and sciatica, hepatomegaly and splenomegaly, obesity, piles, sexual debility, and infertility. The detox and weight loss retreat begins with an Ayurvedic consultation provided by our on-site Ayurvedic doctor. The in-depth exploration of your normal diet, lifestyle and habits, mental and emotional state, and many other personal details will provide the information necessary for our doctor to determine your body type from an Ayurvedic point of view and design your detox and rejuvenation program. The treatment plan will combine Ayurvedic rejuvenation therapies along with specialized Yoga classes structured according to your body type. The itinerary for this retreat is decided only after consultation with the on-site doctor and can change from person to person. However, please communicate with Bodhi Center if you would like to know more about the sample day to day activities. After a full week of therapy and treatments, day 8 is an optional free day. However, guests are welcome to stay at Hinterland Village and enjoy all the facilities available. Jayesh holds a master's degree in yoga and is a qualified instructor of both Hatha and Ashtanga traditions. For the past five years, he has traveled to various parts of the world to share his passion for teaching yoga and spirituality to a vast number of people from different walks of life. Jayesh works at various yoga centers around India where he teaches Hatha yoga, asanas, pranayama, Nidra yoga, kriyas, meditation, and different stress management and relaxation techniques. He also specializes in diabetic therapy and professional yoga. Saji Ramaswami is a professional yoga trainer and a spiritual teacher with special experience in the classic style of yoga, meditation, and philosophy of yoga-vedanta. He has been practicing yoga for more than 20 years in various ashrams and yoga schools in India. He is working as a yoga master with Hinterland since 2015 leading their yoga retreats and teacher training workshops. His special techniques combined with his gentle, peace, and kind manners, helps beginners as well as skilled yoga practitioners. Many yoga and spiritual aspirants have benefited from his inspiring talks and teachings. Doctor Dinesh is a professional Ayurveda doctor for the past 20 years. He works as a visiting consultant physician, teaches students and organizes seminars, workshops, research on Ayurveda, and other alternative medicines. He has 20 years of experience in teaching about Ayurvedic medicine and is an expert in consultation diagnosis, Ayurvedic food, natural and organic system. Harilal is a professional Yoga Teacher with 14 years of experience in Yoga teaching at various parts of the world. He has been qualified from The International Sivananda Yoga Vedanta Centre, Iyengar Yoga Teachers Training Centre, Ayurveda Panchakarma therapy and Spa Massage Therapy. Aje Nyah follow firm principles of classical Indian Hatha yoga as well asAncient Egyptian Kemetic yoga. Aje also gives lectures and talks about Integral Wholistic Yoga Philosophy. His spiritual reasoning’s draws inspiration from the natural world and our connection with nature. Being a naturalist,organic farmer, wildlife filmmaker and a spiritual musician; he has some unusual perspectives and eye-opening views about life and the human experience, health and environmental conservation. Irie Nyah, Yoga Teaching designed for women at all stages and phases with special focus on pregnancy and preparation for childbirth. However all women desiring to connect more deeply to their femininity or prepare their body, mind and spirit to welcome new life will benefit from these unique sessions. Irie is a Yoga Alliance certified Hatha Yoga teacher and has been teaching for the last two years in India and Australia. This retreat will take place in Hinterland Village. With seven acres of lush greenery, it is a haven of rich native biodiversity and an oasis of peace on the outskirts of the city of Kochi. Hinterland Village boasts more than 180 native species of flora that grow abundantly and naturally throughout the year. The Bodhi center at Hinterland Village was an initiative undertaken by its founder, Unni, to promote yoga and Ayurveda. Unni’s desire was to create a space where guests and visitors could immerse themselves in spiritual practices in a peaceful and natural environment. The Bodhi Ayurveda and Yoga center at Hinterland Village is a spiritual paradise set amidst jungle giants overlooking a paddy field. The space around the Bodhi Ayurveda and Yoga center is a paradise for bird watching and nature walks. The resort also has a swimming pool set amongst the greens so guests can cool off from the South Indian heat. Hinterland Village takes pleasure in harmonizing with nature and guests are encouraged to do the same. As the name Bodhi suggests, the aim of the retreat is to seek enlightenment regarding one’s own body and mind. As humanity often strives in chaos, Bodhi, or one's awakening, is an essential journey that everyone eventually has to take. In this sense, constant efforts are made to provide the most comfortable space for guests to practice yoga, to enjoy the special treatments, and to engage in the mutual exchange of ideas and thoughts. You will enjoy a healthy selection of balanced food made by the resort's excellent cook. Special care is taken in providing the best diet and nutrition for guests. Biking and hiking are the best activities you can do to see the beautiful surroundings of a modern-day Kerala village. Nature walk, swimming and village tour. This retreat includes a consultation with an on-site Ayurvedic/ Naturopathy doctor and you will receive treatments according to your body constitution. Massages and steam baths will be scheduled during your stay, Naturopathy, Hydropathy, acupuncture and Kriyas will be provided as per need. Please book your flight to arrive the Cochin International Airport (COK). Transfer from and to this airport is available upon request. Bodhi Ayurveda and Yoga Retreat promotes and provides yoga classes and Ayurveda treatments and uses a holistic approach to purify the body and mind.